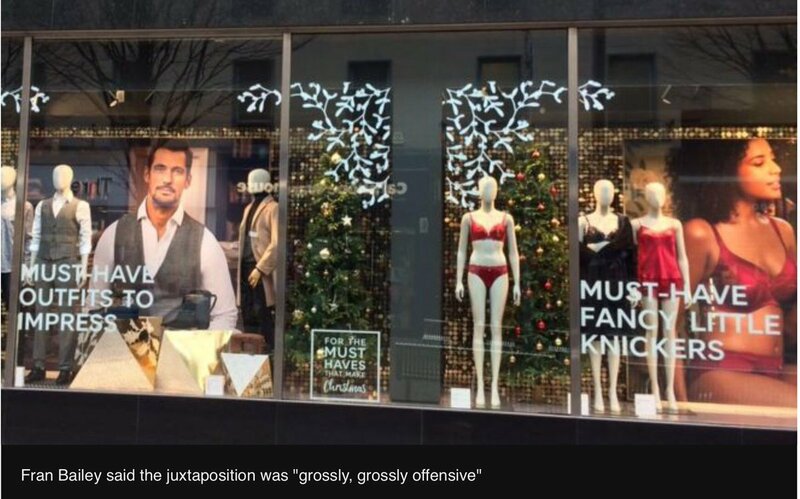 A Christmas display at a Marks & Spencer in Nottingham, Britain has feminists crying sexism for advertising a women's "must-have fancy little knickers" beside a men’s "must-have outfits to impress." Feminists did not take kindly to the ad, with many blasting it as "grotesque" and "vomit-inducing." After it went viral online, protesters defaced the women's underwear slogan to read "must have full human rights." The Facebook group Feminist Friends Nottingham received an outpouring of complaints from several women shoppers. "Ok, M&S Nottingham, have we really not learned anything in the last 35 years? Or am I alone in finding this, their major window display, completely vomit inducing?" said shopper Fran Bailey, who chastised the ad for both "normalization of damaging gender stereotypes through the juxtaposition of images of women apparently obsessed with ‘fancy little knickers’ with images of fully clothed men being ‘dressed to impress’ in suits," and also the slogan "must-have" when "huge numbers of Britons are struggling with poverty." "I think M&S using such a strapline is just really crass when so many are without the necessities of warmth, shelter and food," she said. "The problem is that we’re so browbeaten by this sort of imagery that we don’t even recognize what it is anymore. It’s pandering to notions of gender that are so outdated that it’s unbelievable that it’s still being spouted out. I’m disgusted because I’d have thought that M&S was a grown-up store that knew better. I know M&S is not the worst offender by any means but this particular juxtaposition is just grotesque." Mark & Spencer later covered up the ad, asserting in a statement that the Christmas display had been taken out of context. "We’ve highlighted one combination in our windows, which are part of a wider campaign that features a large variety of must-have Christmas moments, from David Gandy washing up in an M&S suit through to families snuggling up in our matching PJs," Marks & Spencer said in a statement. The largest feminist conference in the U.K., FiLiA, has now demanded Marks & Spencer change the ad while requesting to know the mastermind behind the display. Both sides of the billboard are meant to poke fun at the neighborhood just ahead. The side heading into south London is a bit more upfront in its insult, but the side heading into north London isn't meant to be a celebration of north London's apparent superiority. Similar ads have been popping up across the globe. The ad pictured above this story references New Yorkers, shredding them for being "rude," "loud," and "angry." The Grinch has been excoriating residents of Chicago, Washington, D.C., and Los Angeles in a similar way. But some people just can't take a joke — and it's probably no surprise the people who can't take this joke are British diversity activists who aren't happy that the Grinch is reinforcing "stereotypes." Political correctness for Christmas came earlier this year than expected.